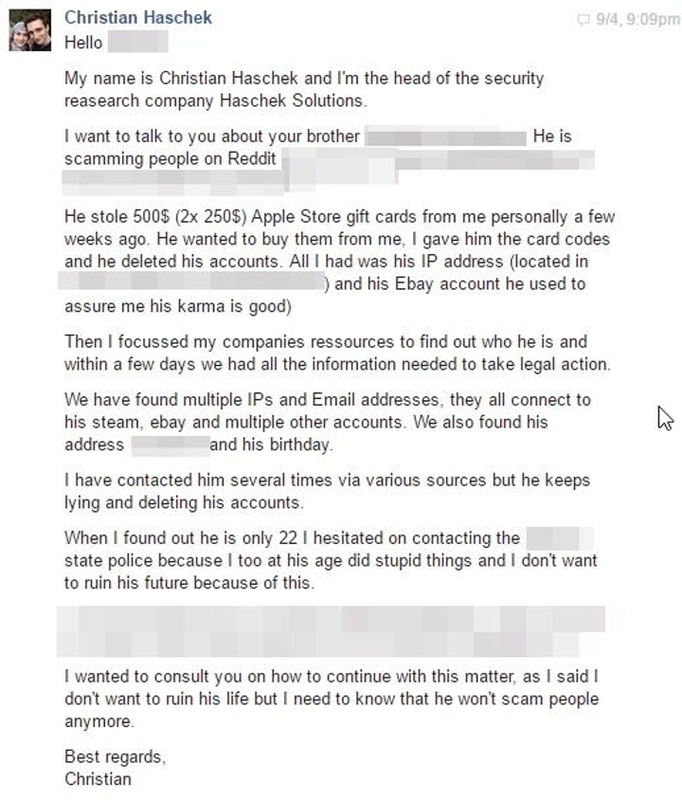 Christian Haschek recently decided to sell a $500 Apple store gift card he's been trying to get rid of for years on Reddit, which in hindsight, probably wasn't the best idea. Shortly after posting his thread, he found a buyer who wanted the card to be mailed to him before he would pay up. Haschek agreed since he'd been trying to get rid of the card for 4 years and wanted to give the buyer the "benefit of the doubt." But when the cards were marked as delivered, the scammer started deleting all of the accounts he used to contact Haschek. Unfortunately for the scammer, Haschek is a cybersecurity researcher who owns a company that employs a lot of other cybersecurity researchers. He was quickly able to track down the scammer's Facebook account, by searching his username and going through the Facebook page of one of the scammer's friends. And since he didn't think he'd get a reply from the guy who just stole his gift cards, he messaged the scammer's brother and mother instead. Within ten minutes of sending those messages, Haschek received a desperate message from the scammer himself. And it's pretty damn satisfying to read. "I am sorry for what I did. I am young and stupid and always in a really bad place. I ama full time student and I have no job. I contacted Apple and got a giftcard back. I can. Give you your giftcard back I have a card for $477 and one of the existing card you gave me should have the remaining balance. Please leave me alone after this I won’t do anything like this anymore I am having panic of attacks just thinking about this." "I do not have the bitcoins if I did I would have sent it to you already. I have literally 0 money and as a full time college student I have no savings please I beg you to understand I have had a handful of anxiety attacks in the past few days over this issue and I am extremely scared. All I want is to leave me alone I know what I did was wrong please I beg you to forgive me." "I will never do anything like this again. I have 6 classes and I am a full time student I can't even go to work to pay you back. I would immediately pay I back if I could but I am broke and living on cheap fast-food. Please I beg you to forgive me and accept the card I returned I am very sorry I did this to you." Haschek agreed to not contact the cops if the scammer sold the cards and transferred him the money, which he did. But he warned the scammer that if "I ever catch him scamming people I'd drop everything I have about him." 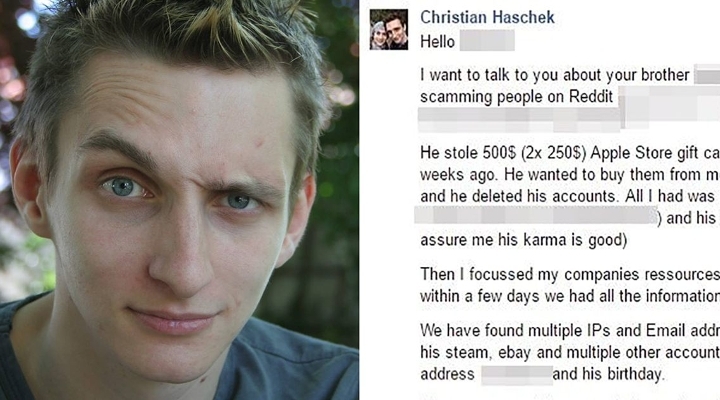 And of course, the scammer proceeded to beg Haschek to delete the message he sent to his mom. "Again I am so sorry and thank you. Can I also ask you to delete all contact with my family and friends you contacted my brother and he is freaked out. Can you please delete or make something up before my mother sees the message you wrote her and avoid further contact with my brother and delete him. Please and thank you."